This article is for the franchise, for the title character see Super Sonico (character). 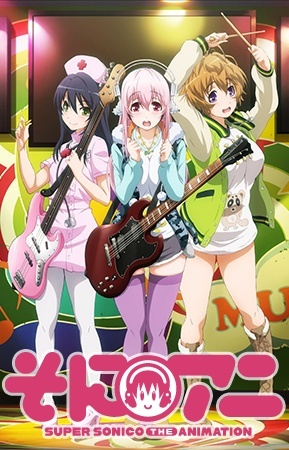 Super Sonico is a franchise centered around the Nitroplus corporate mascot character of the same name. It has been branched out into media such as visual novels, figures, artwork and a 2014 anime series. Sonico has an Off Screen Shower. Sonico takes a Bath in a Flashback at her grandmother's house. The episode preview at the end shows part of Sonico's bath scene for episode 5. This page was last modified on 5 April 2016, at 13:48.